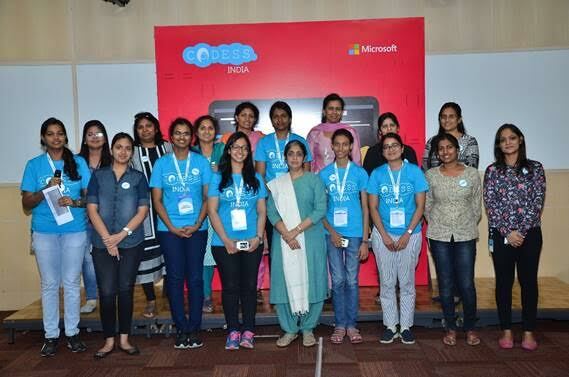 Hyderabad: Microsoft hosted the final showcase of the India chapter of Codess at the Microsoft India Development Center campus in Hyderabad today. The event was focused at empowering, educating and celebrating a community of women coders who have an interest in shaping technology innovations of the future. Codess is a global engineering forum for women initiated by Microsoft. It is an example of Microsoft’s external engagement with the community to promote gender diversity in the engineering field. With previous events across Eastern and Western Europe, Asia and the US, Codess is making its way across the different engineering communities throughout the world. Young women coders in India were introduced to this initiative in 2016. This year, Codess has received 1200 plus applications from over 40 colleges across the country. Reaffirming Microsoft’s commitment to empower girls by opening a window into a world of technology-related careers that help them solve the problems they care about the most, Charumathy Srinivasan, Partner Group Engineering Manager-Cloud & Enterprise Division said, ’Microsoft has organized this program to develop capabilities and skills in STEM (Science, Technology, Engineering and Math) and increase the women workforce in technology. This group of girls have a real passion to shape tomorrow, yet only a few of them realize how STEM is foundational to have the impact they can create. They came together and discussed their ideas and innovations on how to be a part of the future #MakeWhatsNext’. Codess is just one example of the gender diversity initiatives that Microsoft is engaged in. Microsoft also offers the technology program DigiGirlz which is a Microsoft YouthSpark program giving high school girls the opportunity to learn more about careers in technology, connect with Microsoft employees, and participate in hands-on technology workshops.